I love Sundays, I really do. But then, it’s hard not to love a day that starts out with Chris letting me sleep in. Saturdays and Sundays, Chris gets up early with Nora and I get to enjoy a bed to myself for a few hours. He has to put a baby gate at the bottom of the stairs to keep her from coming up to find me, but I am able to sleep uninterrupted past 7am. This morning when I got out of bed around 9, Nora was running around the living room munching on a waffle and wearing her bathing suit cover up. He said that she picked it out all by herself – she kept saying no to the clothes he got out until he held this up and she said, “Uh-huh, uh-huh!” It was pretty cute and some how appropriate since it was 50F out today! I know my friends and family in Texas are probably laughing that I’m excited by 50 degrees, but it really felt like spring. In fact, it was perfect for a long walk in only a sweatshirt and light jacket. After Chris went to work, we met my friend Logan and Mr. T for a long walk. She led the way and I was excited to discover something new. We ended up walking nearly 8 miles down to Surfside beach. My legs are super tired now, but it was worth it. Sometimes I forget just how small our island is; I usually stay in town, at most walking along the harbor. But today I got to see a little bit of a different shore. 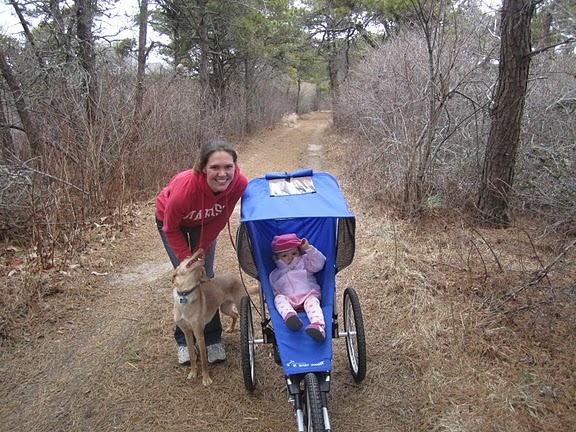 We walked through some new neighborhoods, down Land Bank trails, and across previously undiscovered dunes, almost, but not quite, to the ocean. I couldn’t help but think that I couldn’t be doing this if I were still in New York…or Texas…or Iowa. This place is so amazing. This life is just so amazing. One of the things I’ve been loving lately is Toddler Time at the ECC. Where we do fun things like make “slime” and arts & crafts, and sing songs and play with other toddlers. 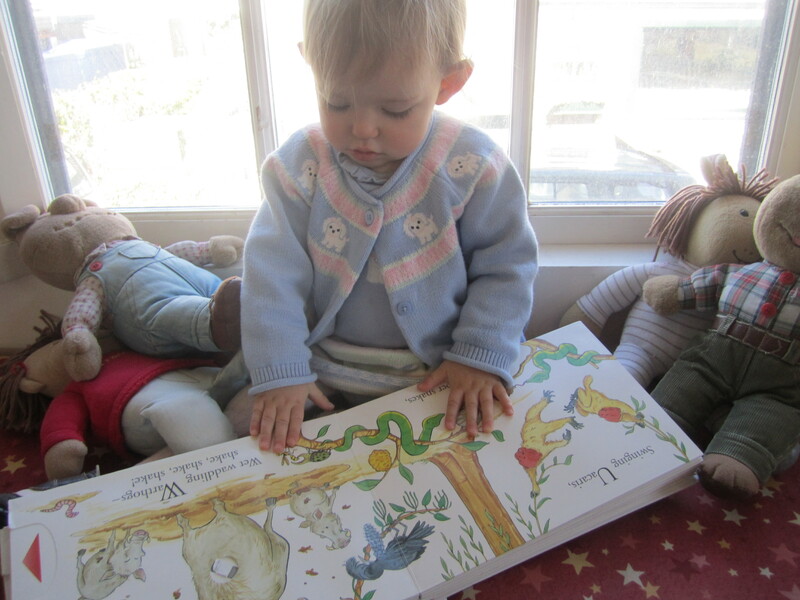 We also went to our very first story time at the library this week, which she loved. I feel so lucky to be able to do these things with Nora. Most family activities (like these) take place on weekday mornings, and if I had to work, we wouldn’t get to do them together. I love knowing that I’m the one exposing her to new things, not a babysitter or daycare provider. And this: Not to mention, countless hours with Chris on weekday mornings before he goes into work. So we shelved that thought, and just squeezed our budget tighter to make the most of what we have. Hopefully someday we can rely on the store, too. In the meantime, we are scrimping to be able to save for the store and to make an attempt at Dave Ramsey’s Debt Snowball. And that’s okay, because it feels like we’re accomplishing something. I may not be doing yoga, and I may only have a mostly clean house, but I am mastering the grocery bill! And next week I’ll take on something new.